Promoted by EMCY, GMAF - Play! Qingzhu Weng was born in 2001 in Zhejiang, China. 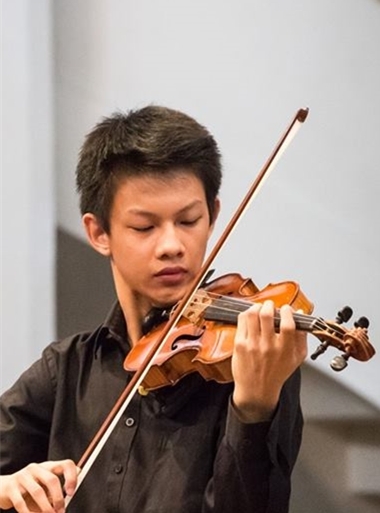 He started studying violin at the age of four and visited the Xiamen Music School and the Music Middle School Affiliated to the Shanghai Conservatory of Music in China. In 2014, he became a student of the Institute for the Early Advancement of the Musically Highly Gifted (IFF) in Hannover, studying with Prof. Krzysztof Wegrzyn, and continued studying with him since 2017 as a bachelor student of the Hanover University of Music, Drama and Media (HMTM Hannover). Qingzhu Weng won the first prize of the “Hua Guang Cup” national competition in China at five years old. In 2016, he won a first prize in the national competition “Jugend musiziert” in Germany, and the first prize of the String Concert Academy Competition in San Marino. He also won the fourth prize and the EMCY prize in the International Competition for Violin in Kloster Schöntal. In 2018, he won the first prize of the Ysaye International Music Competition and the third prize of the Tibor Junior International Violin Competition. His first recital took place in China at the age of eleven. In 2017, he held three recitals in Bologna, San Marino and Imola and in 2018 in Hannover and Bergen, the Netherlands. He played as a soloist with the Studentische Philharmonie Hannover, the Loh-Orchester, the Pforzheim Chamber Orchestra, the HEMU orchestra and the Kremerata Baltica. If you are interested in working with Qingzhu, please get in touch with the EMCY Office.